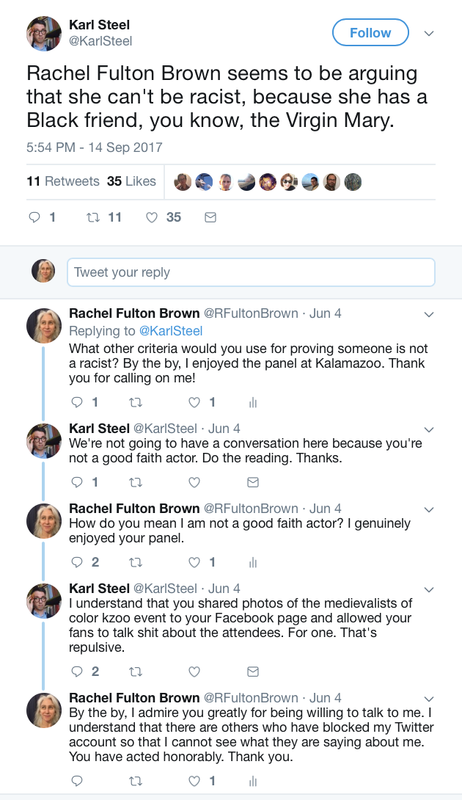 I met Karl Steel for the first time a month ago at the International Medieval Congress in Kalamazoo. I was standing in the book exhibit near the display at Scholar’s Choice for my new book...and there he was! The colleague who had so generously christened my fabulous Facebook friends “Random Laypersons”! I was delighted to finally meet him and tell him how much we enjoyed the joke. I had no idea he had been tweeting about me for the better part of a year and half. Before I learned to search Twitter this past week, all I knew was that he had ridiculed my Facebook friends for being interested in learning from me. I know now that his interest in me was, shall we say, somewhat more persistent. He has, as it turns out, been tweeting about me since December 2016, when Breitbart published one of my earliest blog posts about Milo. 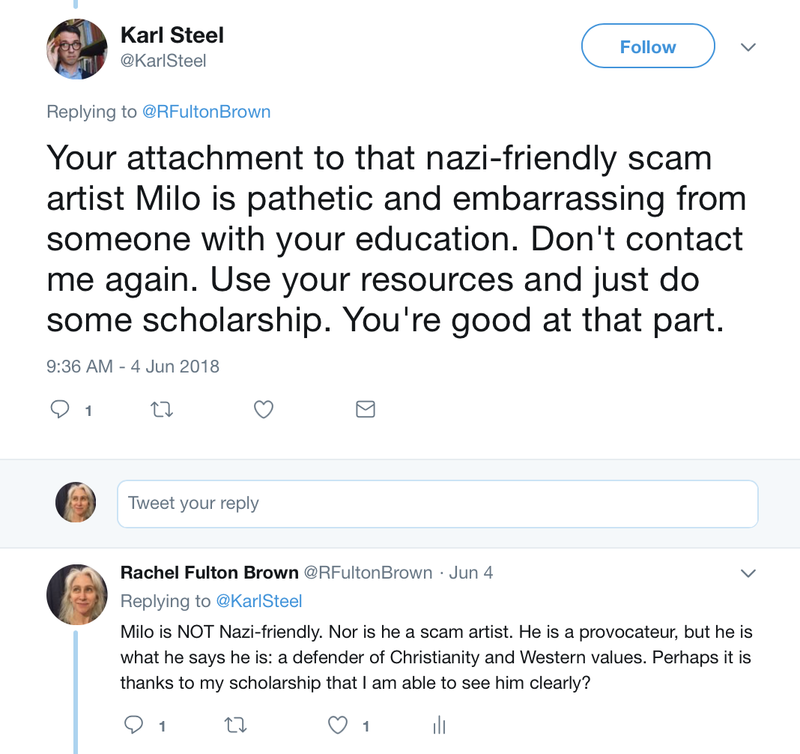 Karl’s take: I have clearly surrendered any scholarly credentials I may have had by standing up for a victim of pedophilia. Oh, no, wait, that’s not at all what he said. The adjectives alone are enough to strike terror into the faint of heart. That I dared to write about Milo and—gasp!—publish on Breitbart was “ghastly,” as one of my former students put it. Karl agreed. Friends warned him to lock his account lest the Breitbart trolls come after him. I am curious that he did not, given that he clearly expected the worst. 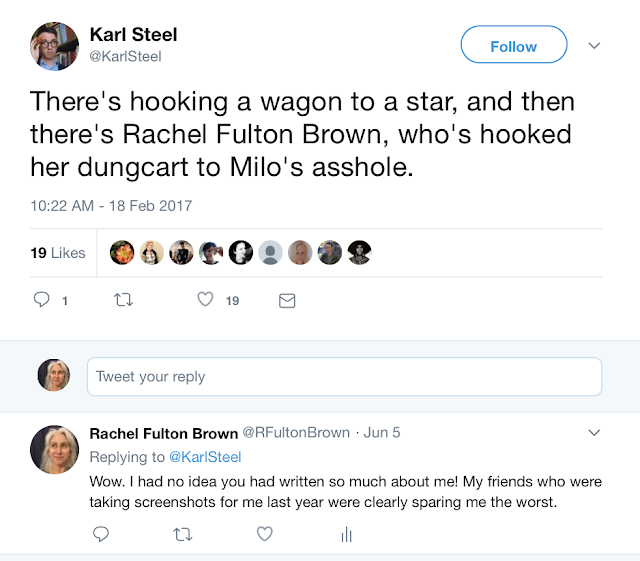 Instead, Karl kept tweeting about me, even before the Reagan Battalion hit on Milo on February 20, 2017. 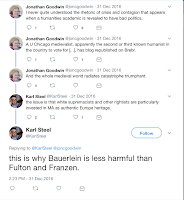 According to Karl, I and our fellow medievalist Allen Frantzen are “harmful” because “white supremacists and other rightists are particularly invested in MA as authentic Europe [sic] heritage.” Never mind that I had explicitly written against precisely this claim—that Europe was ever great because it was “white” (or “male”)—long before I started writing about Milo. That was the whole point of my original post on “Talking Points: Three Cheers for White Men”: to recover some sense of what makes Western civilization good for women. I used the term “white” as an allusion to the much derided “Dead White European Males” of the older Western civ curricula. No matter. 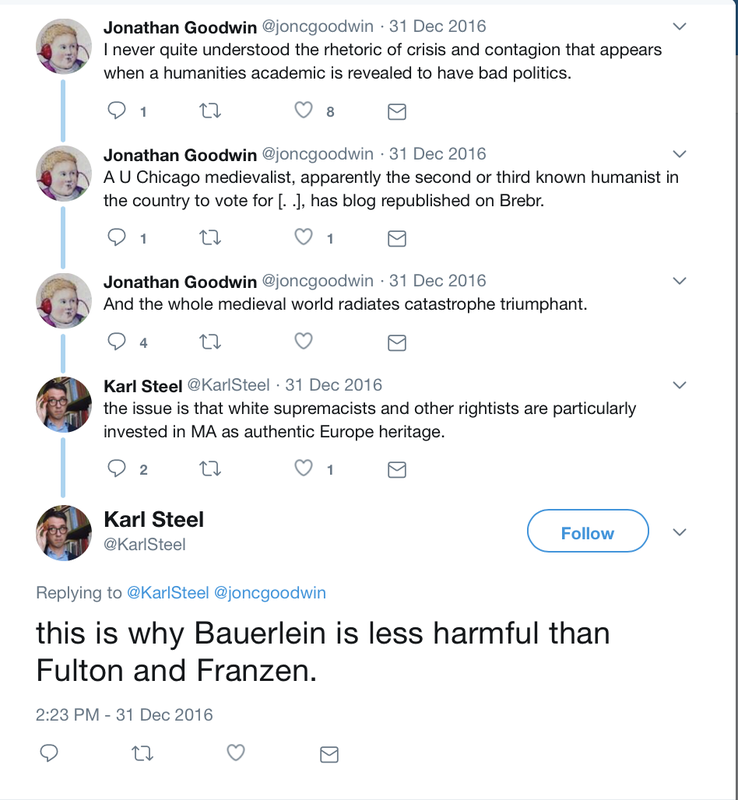 Because I defend Western civilization as the source of the very criteria by which Karl and my other medievalist colleagues would damn me—for its ideals of inclusion (a.k.a. Pentecost), respect for women (a.k.a. Galatians 3:28), and valuation of labor above class (a.k.a. bourgeois virtues)—I am to be cast into the outer darkness of academia. 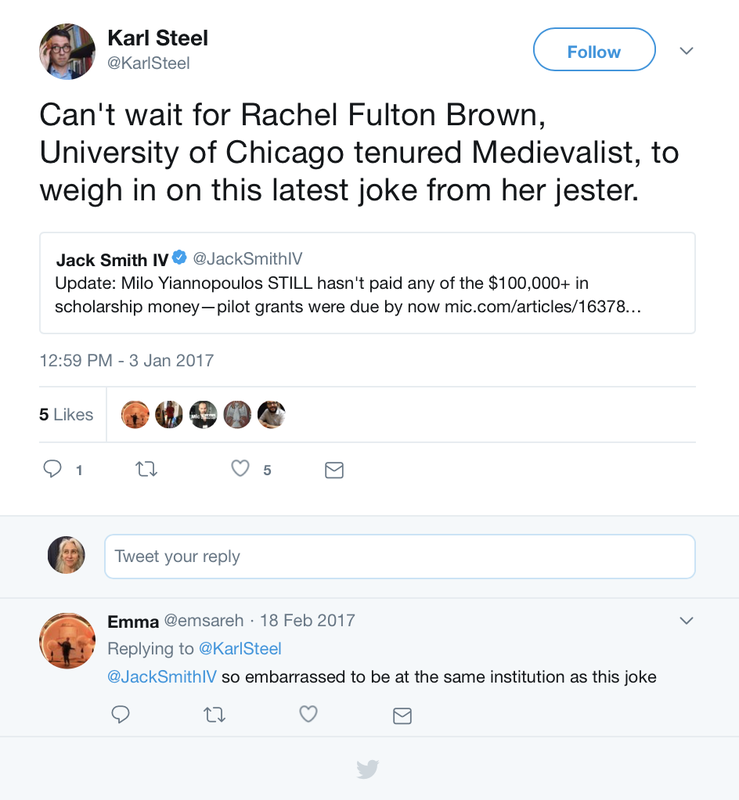 No, like a good SJW, he doubled down, particularly in September when I wrote about the way in which one of our other colleagues in Medieval Studies had been posting on social media about me. I have no idea what “stuff now” he was talking about. This conversation took place in September 2017, and my new book came out in November. 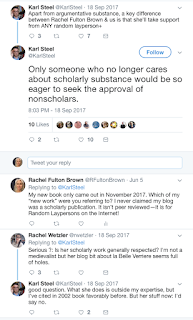 Perhaps he thought I was claiming scholarly credentials for my blog? 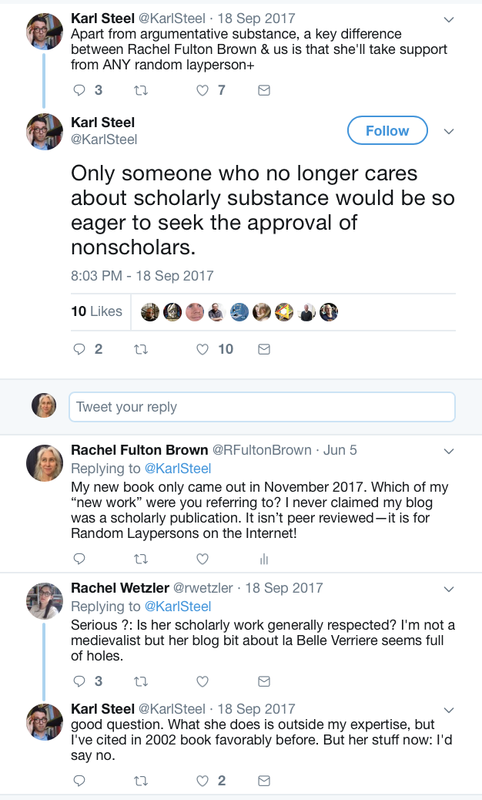 Which is funny, because one of the reasons that I started the blog was specifically because it was not peer reviewed—indeed, because I wanted to write about my experience as a fencer and a Christian for Random Laypersons and scholars alike. 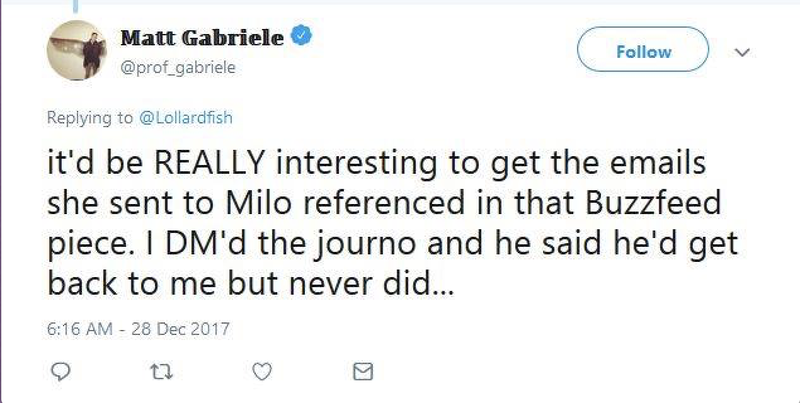 It is the same reason that I started using my blog to write about Milo: because he is Christian and a cultural fencer. I saw it immediately when I started watching him that he was a champion in our spiritual duel against the use of trigger warnings and political correctness. 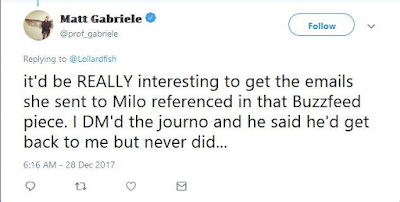 (No, for the gazillionth time, I don’t think Milo is Christ; I just think he is following in the pattern of Christ’s story, which medievalists should recognize even if no one else does). 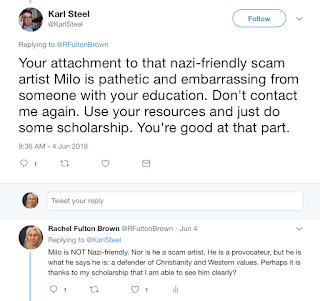 I tried to explain this motivation to Karl this past week when I found the tweets he had posted about Milo and me. 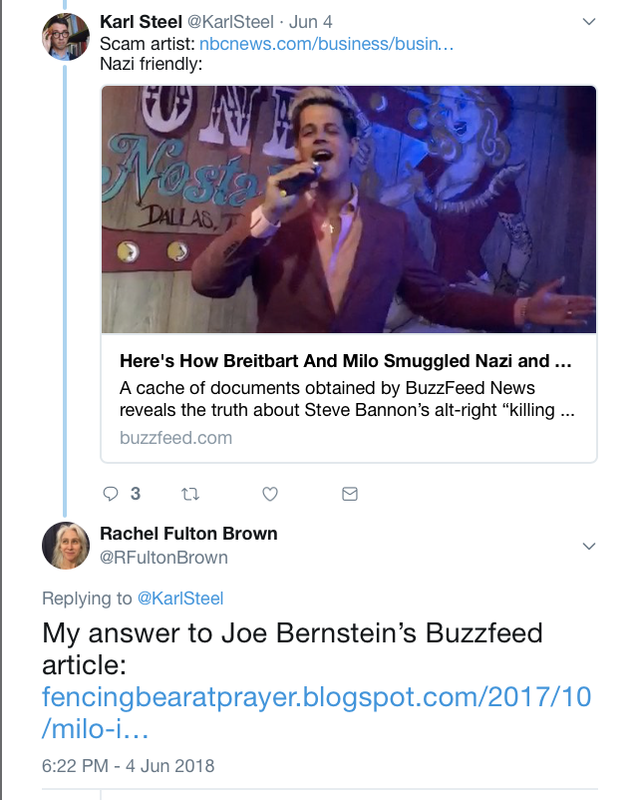 And then he posted a number of articles which he thought proved that Milo was a “nazi-friendly scam artist,” most particularly Joe Bernstein’s article in Buzzfeed. I even have emails in my own inbox from Bernstein from the day before the article came out telling me that he was “working on a story [he felt] confident [I would] want to know about” and asking me to call him the next morning. 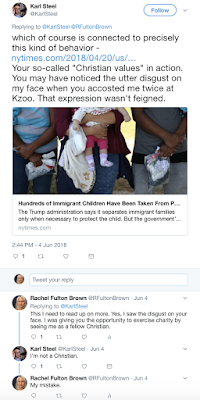 I wrote my own response on my blog a day or so later. I am curious that Karl seems not to have read it. Because, you see, he seems to haunt my social media for mentions of himself. How else did he know within a day that I had made a joke about his calling my Facebook friends “Random Laypersons”? Aha! He is a younger sibling, academically speaking. We both did our doctoral work at Columbia. That could explain it. Sibling rivalries are always the most vicious. I get now why Karl had that look on his face when I met him by the book exhibit at Kalamazoo. Who knew that he had said all these things about me? No wonder he froze—and then later accused me of accosting him. Wait. 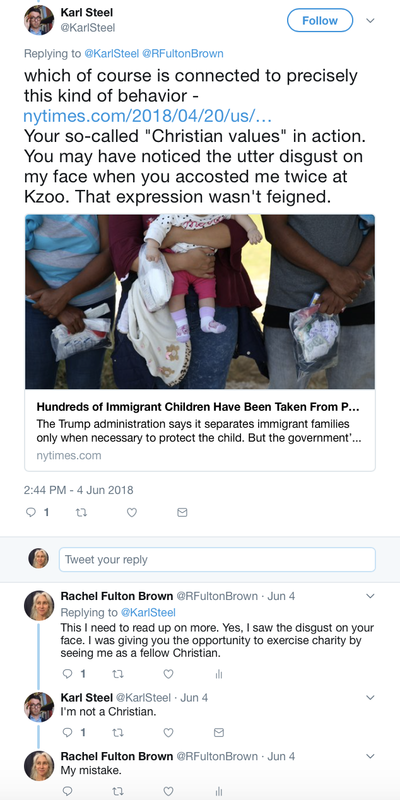 I thought their whole schtick was claiming that we Random Laypersons are a rampaging mob that terrorizes people on social media. Now the complaint is that we *don’t* rampage? We don’t even have the power to rampage? We just, y’know, hang out in your Facebook salon like the civilized middle-aged people we are and quietly shake our heads at the craziness? Well, duh. **Meanwhile, I have other colleagues fantasizing about using the emails leaked to Bernstein against me. Academia, eh? 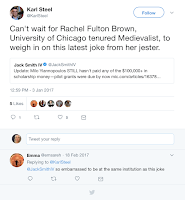 See MedievalGate for my continuing adventures as a conservative in academia.